I've been learning how to create amigurumi for the past two months, and I admire the fun and challenge of this crochet artform. Like many people, I work in front of a flat computer screen everyday, so it is refreshing to crochet something that exists in non-digital 3D space! I was inspired to try amigurumi by many talented artists on the internet (especially Yummy Pancake). And I was encouraged to continue the craft by my supportive girlfriend (who can crochet a mean scarf) and family (who are used to my artsy, non-sporty pursuits). My first crochet creation was an orange. But most people thought it was a pumpkin. 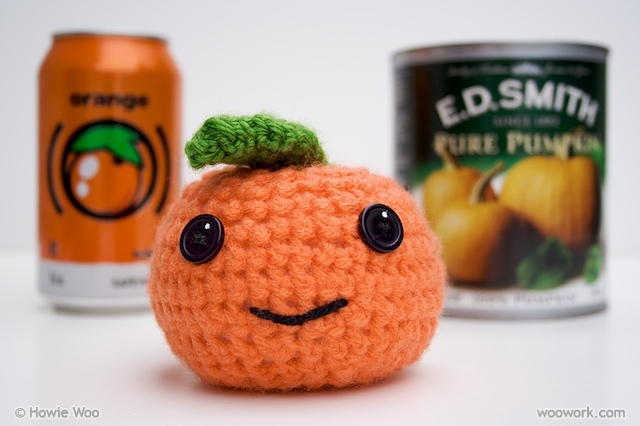 I went with the flow and now describe my first amigurumi as a "genetically-modified pumpkin-orange hybrid". Or an "orangekin". I'm hoping my amigurumi skills will improve, and I hope you'll enjoy viewing my future crochet creations on woowork.com! I found this blog through a click on another blog that led to your scissors post on Craftster.com. I came to the blog and read it (backwards for some reason) from finish to start. I love the things you make and the creativity that is shown in your work. I've been crocheting for almost 20 years now (I feel old and I'm not even 35 yet...) and I've never made anything nearly as creative as most of your stuff. You've inspired me to pick the hook back up (I've mostly been knitting these last few years) and try to make something fun for myself. I'm definitely going to try to make the ice cream cones in multiple flavors; they are beyond adorable. Keep up the good work. Can't wait to see what you make next! Totally looks like an orange! Great Job! Hai! I've just read through your blog from the end till the beginning. Thank you for the really fun time I had. Looking forward to seeing your next project! Awesome, I looked at about 8 google images pages until I found an orange, but it was worth it! I look forward to following your blog...today I made up an orange (that I "invented" before I saw your page) as well as a lemon, lime and a bee...boy are my fingers sore!